Lifeline!! | Nicki Kinickie Nicki Kinickie: Lifeline!! Well, Hello!! what have we here? 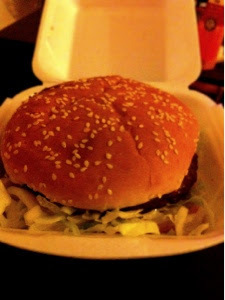 A delicious takeaway burger! my lifeline when I have had a few too many the night before and need something stodgy, fattening and delicious to bring me back to life again!! I must admit, I do have a weak spot for burgers...of all kinds! takeaway, home made or gourmet - they are all good in my books! This particular one was devoured in minutes... yum yum!! Alas, this is yet another reason why I need to get back on the exercise wagon quick sharp!! Damn you beautiful burger! !